Identification. The ethnic Lao in Laos account for 50 to 60 percent of the population, depending on how some subgroups are classified. The way people self-identify ethnically is often contextual. Related groups include the so-called tribal Tai, Black Tai, White Tai, and Red Tai. These groups are not Buddhists and are influenced by the neighboring Sino-Vietnamese culture. The country contained forty-three ethnic groups in 1995 according to the official classification, mostly in the countryside and mountains. The cities contain significant ethnic Chinese and Vietnamese populations. Location and Geography. Laos is a landlocked Southeast Asian country surrounded by Thailand, Vietnam, Cambodia, Myanmar (Burma), and China. It has an area of about 91,400 square miles (236,800 square kilometer). A key physical feature is the Annamese Cordillera mountain range that runs from north to south, along the eastern border with Vietnam. There are other secondary ranges, and to the north of the capital, Vientiane, is the highest peak, Mount Bia. Out of these ranges all the main rivers flow from east to west into the Mekong River. In the north, the Mekong forms a short border with Burma and most of the border with Thailand. Along the rivers there are floodplains suitable for rice paddies. There are no extensive lowland plains. Upland soils are much less fertile, but there are two plains areas: the Plain of Jars, and the Boloven Plateau in Champassak Province. Most of the country is covered by monsoon forests with varied wildlife. A tropical monsoon climate is modified by the mountains. The wet season runs from May to October. Vientiane was the capital of earlier Lao kingdoms. It was destroyed by the Siamese early in the nineteenth century, but the French reestablished Vientaine as the capital in 1893, when Laos became part of French Indochina. A royal capital existed in Luang Prabang until the fall of the monarchy in 1975. The two other main cities, Savannakhet and Pakse, are also on the Mekong. Demography. In 1998, the population was 5,261,000. Urban dwellers made up 23 percent of the population. Close to 70 percent of the population is under 30 years old. Laos is one of the least densely populated countries in Asia. Linguistic Affiliation. Lao is the language of government, education, and mass communications. Lao belongs to the Tai language family. There are variations in pronunciation and vocabulary from north to south. Most Lao understand and speak Thai. Lao has many borrowings from Pali and Sanskrit, particularly in its literary forms. Among the minorities, there is the Miao-Yao (Hmong-Iu Mien) language group, mostly spoken in the north. Among the Hmong, Chinese characters are used in religious rituals. Many Hmong are fully literate in an orthography developed by missionaries, and there is a Hmong messianic script. Among the Iu-Mien (Yao), literate individuals use Chinese characters to write histories. Tibeto-Burman speakers, mainly in the north, also make use of Chinese characters for ritual purposes. Austronesian and Mon-Khmer speakers live in the north but are most heavily represented in the south. These groups have no indigenous tradition of literacy. Illiteracy is as high as 40 percent, primarily among older people and women. Because of the use of Lao as a lingua franca, most people have some knowledge of it, particularly for purposes of trading. Vietnamese and Chinese in urban areas have autonomous traditions of literacy, and have their own schools. The majority of them are also fluent in Lao. Symbolism. The key national symbols are Buddhist, despite the fact that only around 60 percent of the population is Buddhist. Before the revolution in 1975, Buddhism and the monarchy were linked as key symbols. The Communist regime tried to substitute purely secular national symbols, and a calendar of mostly secular holidays was instituted. The flag of the first independence movement in 1945, the Lao Issara, replaced that of the Royal Lao Government (RLG). With the collapse of communism, the state has reverted to purely nationalist symbols; this "retraditionalizing" of the regime has meant a greater prominence for Buddhism. The national day of December 2 was celebrated after the revolution, but has been eclipsed by the celebration of the That Luang Festival. The That Luang stupa in Vientiane, built by the revered King Sethathirat, is one of the most sacred spaces and is recognized by all groups. Other national icons are also Buddhist, but some, such as the megalithic jars from the Plain of Jars, point to complex origins. Much of this iconography was pioneered by the RLG, including that associated with "hill tribes," who are typically presented in their "national dress." In general, national culture symbols are drawn fro Lao culture, suggesting that other ethnic groups are required to assimilate these symbols. This is a source of low-key contention in the country. The appropriation of "old regime" symbols has muted some of the conflict between refugee Lao and the LPDR (Lao People's Democratic Republic), but has led to debates over how much of the past to "revive." Nowhere is this conflict clearer than in the declaration of the old royal capital as a national heritage city by UNESCO, thus making Luang Prabang a symbol of Lao culture and a tourist attraction. This dual use has led to debates about how much of the royal ("feudal") past should be revived. The communist government tried to promote a cult around the communist leader Kaysone Phomvihane after his death, and statues of him were erected all over the country. Emergence of the Nation. The main parameters of the modern state were established by French colonialism between 1893 and 1954: The French delineated the borders and wrote the first national history of Laos. It was also the French who began restoring monuments and constructing a "national" literature. This work was continued by a small group of intellectuals under the RLG associated with the Literature Committee and by the Royal Academy. The LPDR has added little to this stock of national markers. A nationalist movement was encouraged by the French during World War II, and became an independence movement, the Lao Issara. This movement is a claimed by both Communists and anti-Communists. The current regime claims to be the true nationalist heir, but it came to power and survived only with the military assistance of the Vietnamese. This reliance tarnished its nationalist credentials after 1975, but declining reliance on Vietnam in the 1990s boosted those credentials. National Identity. More people of Lao ethnic origin live in Thailand than in Laos. Laos was almost absorbed into Siam and that has tinged Lao national identity with fears of disappearance. The fact that most ethnic Lao in the Thai northeast do not identify themselves with the Lao nation-state is a source of confusion, blurring the cultural boundary between Laos and Thailand. Although Lao and Thai languages are very close, central Thai is the key cultural marker of the difference. However, many Lao consider Thai to be more developed than Lao. Lao identity may have been more clearly demarcated when it had a monarchy of its own. Now, many Lao follow the itineraries of Thai royalty as if to fill a cultural absence at home. Ethnic Relations. An ethnic hierarchy exists, placing ethnic Lao at the apex. Many urban Chinese have assimilated into Lao culture, and even those who have not are considered to represent a major civilization. Vietnamese also have assimilated, and those who have not are situated just below the Chinese, though they are more disliked. A small Indian population lives in the urban areas, and dislike for them usually focuses on their dark skin, smell, and alleged deviousness. There is little intermarriage between them and Lao. The term "ethnic minorities" normally refers to the hill tribes. This initial bipolar categorization of ethnic Lao and minorities gives way to a threefold categorization of the population into Lao Lum (lowland, [ethnic,] Lao), Lao Theung (literally midland Lao), and Lao Soung (literally highland Lao). The government has attempted to come up with a comprehensive classification of the ethnic groups, which ranged in number from sixty-eight to forty-three in 1995. Ordinary Lao are likely to use the tripartite classification or even derogatory terms for those designated Lao Theung and Meo. Most disrespect is reserved for the Austronesian groups in the south, whose pipe-smoking women are singled out for comment. LPDR attempts at resettlement of minorities for political control, ecological preservation of forests, and delivery of social services have been poorly executed and have caused resentment. In the south, this has led to the breakup of matrilineal longhouses as groups are moved into standard housing. In the north, Hmong groups, have resisted these attempts at control, sometimes violently. In its early years the communist government highlighted its alleged respect for minority cultures, but today there is a greater emphasis on Lao culture. Laos is one of the least urbanized countries in Southeast Asia. Vientiane has around 500,000 people, many in rural districts. Savannakhet and Pakse are the next most important cities, while Luang Prabang is the most important historical city. All these cities have a mixture of French colonial architecture, Buddhist architecture in temples, traditional Lao houses raised on stilts, American-style houses built in the 1950s and 1960s, and new large houses that imitate Thai styles. All these cities are built alongside rivers whose banks provide major recreational spaces. Most Lao people live in rural villages clustered around a temple. 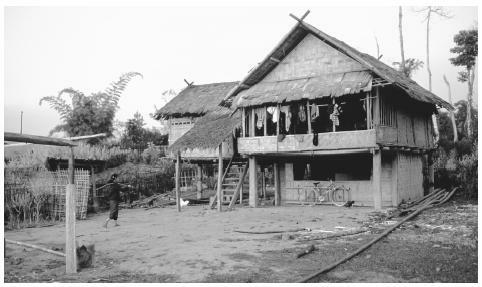 Lao, Tai, and groups such as the Khmu live in houses raised off the ground on stilts. In Khmu villages, instead of a temple, there may be a communal house for meetings, usually used by men. Hmong, Iu Mien, and some other groups in the north build large sturdy houses on the ground. In the south, among the Ta Oi, there are still villages with matrilineally organized longhouses. The temple in most Lao villages remains the main center for social and recreational activities, usually associated with religious celebrations. Food in Daily Life. Sticky rice is the staple. Chinese, Vietnamese, Hmong, and some other groups favor nonsticky varieties that can be eaten with chopsticks or spoons rather than with fingers. Spoons and forks are used to manipulate the dishes that accompany the rice, while sticky rice may be dipped directly into condiments of chili paste and fish paste. Soup is a regular feature of meals. In the countryside, people eat chopped raw meat and foods gathered from the surrounding forests. Hygiene campaigns have caused a decline in the eating of raw foods in cities. Laab , finely chopped meat with spices, is a favorite dish that can be eaten raw or cooked. For most lowland Lao, fish dishes are a central part of the diet. Relatively little pork is eaten, and chicken, buffalo, or beef is more common. An important culinary change in the main cities since the revolution is a spread of dog eating, which previously was associated with Vietnamese and Sino-Viet groups. Dog meat is considered a "strong" male dish and is accompanied by strong liquor. Rice whisky often accompanies snack eating among males, and heavy drinking usually occurs on ceremonial occasions. At the New Year heavy female drinking also occurs. In the countryside and mountains, fermented rice "beer" is drunk from jars using bamboo straws. In the cities, beer consumption is widespread. Influenced by the French, many Lao in cities and small market towns drink coffee and eat bread at breakfast, which strikes Thai visitors as exotic. In the cities there are French, Indian, and Chinese restaurants that cater mainly to foreigners. The dish ordinary Lao most commonly consume in roadside restaurants is feu , a soup-noodle dish imported from Vietnam. Cars on a busy street. Laos is one of the least urbanized countries in Southeast Asia. Food Customs at Ceremonial Occasions. Lao do not reserve special foods for the New Year or other occasions, and foods generally do not have special meanings. Khao poun , a fermented rice vermicelli, signifies life piling up over the years, while aab means luck. Celebrations involve more food and a greater variety of foods, with more sweets, desserts and alcohol. These are occasions for reinforcing village reciprocity and solidarity. End of harvest celebrations are similar. 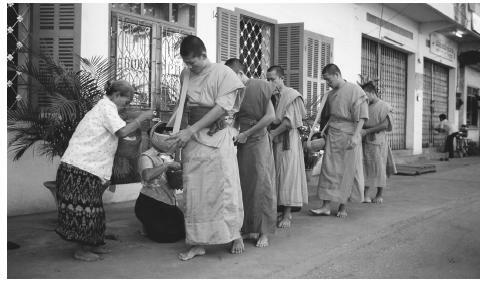 Buddhists make offerings of food to monks from the local temple. Usually this is done when the monks file through the village or city early in the morning. Among some southern minority groups large buffalo sacrifices take place, but they have been discouraged by the government. Less spectacular sacrificing of buffaloes and other animals occurs among all the ethnic groups. Basic Economy. Paddy rice and rice grown in swiddens (slash-and-burn agriculture) in hilly areas provides subsistence for the majority of the population. Maize is important for some upland groups. The rural population consumes most of the food it produces, but Laos is a net importer of food, primarily from Thailand. Market exchange for food occurs in occasional markets and small market towns for most rural people. These towns are also conduits for industrially produced commodities for households and farms. In more remote areas, industrially produced cloth and clothing gives way to home-produced clothes. Market gardening increases near large towns and cities. Land Tenure and Property. Under the RLG, land that was not freehold was technically Crown Land. However, there was a commercial market for land in the towns and some freehold titles were granted to people in the countryside. After the revolution property was nationalized. Only after the economic reforms of the 1990s was private ownership recognized and a foreign-assisted land-titling program now grants ninety-nine year leases and allows for commercial transfer. Most land is subject to recognition of rights through use. In the upland Tai areas there is still a traditional system of mixed communal and family land ownership. Rights to swiddens are based on use. Customary rights are exercised over rivers, streams and ponds, and communal rights apply to some forests. Commercial Activities. After the revolution, there was a massive contraction of commercial activity, especially in services. The liberalization of the 1990s led to the re-emergence of private banking and legal and commercial consultants and an expansion of private restaurants and retail outlets that sell handicrafts such as weaving. Major Industries. Logging and timber have been the major industries and are run by the state and army-controlled companies. In the 1990s, there was a rapid expansion of foreign-owned garment-making factories. Hydroelectric power generation is another major industry. Trade. The main items traded internationally are hydroelectricity sold to Thailand, timber, and garments. Imports include gasoline, vehicles, heavy industrial equipment, and most goods related to light manufacturing. The economy has a chronic trade deficit. Division of Labor. Beyond gender, there is no marked or customary division of labor. Because Laos remains an overwhelmingly peasant society and because there is little manufacturing or industry in and around the cities, a modern, elaborate division of labor remains rudimentary. There are a small number of professionals, such as lawyers, operating in the capital, but most indigenous expertise is located in the state. Besides this, there is a significant foreign aid community that provides a body of professionals across the board. Historically, the Vietnamese have functioned as tradesmen and laborers in the cities, which they still do to some extent. Classes and Castes. Since the abolition of the aristocracy in 1975, there have been no hereditary castelike groups. Many members of the aristocracy fled after the revolution, as did members of the state-based elite, such as army generals, and capitalists and commercial traders, many of whom were Chinese or Vietnamese. The new elite was composed of the upper echelons of the communist state apparatus. With liberalization, this access to power has allowed these groups to branch out into private enterprise. Foreign investment and foreign aid led to corruption in the upper echelons of the state, which then became pervasive throughout. A very small urban-based middle class has begun to form, but most people belong to the peasantry and are powerless and poor. Symbols of Social Stratification. Before the revolution, some styles of dress and fabrics were reserved for the king and his court. Formal dress for all groups imitated courtly style and included the sampot for men and the sinh skirt for women. The sampot is a traditional form of dress not unlike the Indian dhoti in which the corner of cloth is drawn up between the legs and tucked in at the back, thus forming a kind of billowing short trousers. The sinh is a long traditional skirt that is usually made of silk and that features a wide and often elaborately woven section at the foot. Minorities, especially women, wore Lao dress or traditional dress. After the revolution egalitarian dress was emphasized. In the 1990s much of the older dress style came back as the new rich elite publicly flaunted their wealth, and elite men now wear business suits. In everyday life dress styles have diversified. Courtly language was abolished after 1975, and egalitarian forms such as "comrade" became widespread. Deferential forms continued to be used with Buddhist monks and in the family. With the formation of the new elite and liberalization, these deferential forms have reemerged in public life. Government. Until 1975, the RLG attempted to maintain a fragile liberal democracy, but it was undermined by the conditions of war. Since 1975 the country has been a communist one-party state. Until the proclamation of a constitution in 1991, the Communist Party ruled by decree. The constitution provides for a National Assembly that is elected for terms of five years. While seats are contested and contestants do not have to be members of the Communist Party, they must be approved by that party before running for office. No other parties are allowed. The country is administratively divided into sixteen provinces, and key positions in the provincial administration are held by party members. A judicial system was reestablished in the 1990s, partly because of the demands of foreign investors, but judicial decisions are not independent of the ruling party. A major instrument of government is the Lao Front for National Reconstruction, which controls all the major social and cultural organizations, such as the Buddhist Sangha, the Lao Womens' Union, the Trade Unions, and youth organizations. Leadership and Political Officials. The key to political advancement is a membership in of the Lao Peoples' Revolutionary Party. In the early years of the regime, political criteria for membership were paramount, including "class background." As a new elite has consolidated itself, family politics and connections have come to play a prominent role in gaining access to the party and the privileges that flow from it. Members of the old grand families have gradually been able, through intermarriage with the emerging communist elite, to "cancel out"
A group of Buddhist monks visit houses at dawn to collect alms in Vientiane. their class background for political purposes while trading on their possession of cultural and economic capital. This elite has gravitated toward deeply rooted symbolic practices of power, such as sponsoring temple rebuilding and the casting of Buddha images. With the growing economic power of these new elite families, more conventional entourages have gathered around "big men," who demand deference, which was frowned upon in the egalitarian aftermath of the revolution. Social Problems and Control. After the revolution, socially undesirable people such as prostitutes were sent to "reeducation" camps and the army and party exerted social control. Movement was restricted, and visitors had to be reported to the village head. Permission had to be sought for celebrations such as marriages and housewarmings. After the 1990s, restrictions on domestic and international travel were eased. The liberalization that occurred in the 1990s has seen the opening of discos and bars in urban centers and the reemergence of prostitution, drug use, and petty crime. This is the product of an inadequate education system and a lack of economic opportunities for youth. To deal with this and "spiritual pollution," the authorities occasionally crack down on bars and insist that women wear traditional dress, men not grow their hair long, and less foreign music be played. In rural villages, disputes are handled as much as possible by village committees, usually made up of senior men. Intravillage disputes are handled by the district administration, with attempts to follow party guidelines and local customs. In general, the aim is to achieve a consensus. Military Activity. The government that came to power in 1975 was largely oriented toward military activity, and military norms were dominant in its early years. However, the leadership of the Communist Party was primarily made up of professional politicians. In the 1990s, this changed as professional soldiers took key positions of power in the state and the party. The current government combines elements of an orthodox communist state and a military dictatorship. The rise of the military is partly a product of the waning of orthodox communism, but the military also has come to play an important economic role. A house in the small northern town of Xiang Kok. Most Lao people live in rural villages clustered around a temple. women's education programs, are financed and partly run by bilateral aid donors and international organizations. Nongovernment Organizations (NGOs) established by Lao nationals are not permitted. International NGOs have been allowed to operate since the early 1990s, but they have to be connected to a particular ministry or government organization so their activities can be monitored. Relations between some NGOs and the government have been strained, particularly over the issues of dam building and the relocation of minorities. Attempts to establish an informal NGO forum to discuss development issues have failed. Nevertheless, their presence has seen the emergence of discussions of politically related social and cultural issues, in which Lao employees participate. Division of Labor by Gender. Besides age, gender is the main way in which social roles and practices are organized. In Buddhism, men are the main religious leaders as monks, and while women can become nuns, it does not entail a sacred transformation. Women are the main everyday supporters of Buddhism. Shamanism among Lao is usually a prerogative of women. There are male shamans, but monks often traffic in magic and preempt their role. Among non-Lao groups, men play the main role as religious practitioners, usually practicing a form of shamanism. In rural areas there is no separation of tasks by gender, except for weaving, and, among the Hmong, sewing. There is a tendency for women to be concerned with household chores and 'lighter' work. Women have played a major role in petty trade, and recently in long-distance trade. Men predominate in public political positions, but this is slowly changing. The Relative Status of Women and Men. Women were given full citizenship rights in 1957 when they received the right to vote, ten years after men attained that right. Since that time they have been formally equal in the eyes of the state. Socially and culturally, their status has been ambiguous. Among the Lao, women have considerable social and cultural status by virtue of the tendency toward matrilocality. This gathers together groups of related females and unrelated males and thus potentially strengthens female solidarity and influence. While men are considered culturally superior because of their ability to become monks this status is affected by social class. Men have status because they occupy key positions in the public realm. Women have relatively high standing in the private and civic realms. Among patrilineal groups such as the Hmong, women have less influence socially and culturally; among the matrilineal groups in the south, such as the Ta Oy, they have relatively high status. As these groups are resettled, however, that status rapidly collapses. Marriage. Ethnic Lao partners have a considerable degree of freedom in choosing a spouse, although there is some preference for cousins. Parents may propose a potential spouse and must be consulted about potential marriage partners. A payment like a bride-price is made, and its value varies considerably. The marriage ceremony usually takes place in the bride's family home. At the center of the ritual is a spirit-calling ceremony. Groups were allowed before 1975, when they were outlawed, and reemerged unofficially in the 1990s. Divorce can be initiated by either party and is not uncommon. Among patrilineal groups, parents play a much more active role in choosing spouses for their children. Among the Hmong, there has been some practice of so-called marriage by capture. Residence in these cases is patrilocal. Polygyny is found among some highland groups. Domestic Unit. A tendency toward matrilocality among ethnic Lao means that the main house at the center of a group of related women almost always contains a stem family. The oldest daughter and her husband move out after the marriage of the next daughter but try to live nearby or in the same compound. The main house usually is inherited by the youngest daughter, who is responsible for the care of aging parents. The proximity of nuclear households and their continued relationship with the main house creates the appearance of a modified extended family. However, these new units move eventually, separate from the original main house and become main houses. Among highland patrilineal groups, there are large houses containing extended families of related brothers, while in the southern highlands, there are extended families of related women. Men generally are recognized as the household head for religious and political purposes. Inheritance. Aside from the inheritance of the main house by the youngest daughter among ethnic Lao, inheritance tends to be equal between sons and daughters. Residential practices determine what is inherited, with those moving away, most often sons, selling land to their sisters or leaving it in their care. The passing on of a house and productive land signals the passing of authority from one generation to another. Jewelry and woven cloth pass from mothers to daughters. Among patrilineal highlanders, houses and land, if they are held by residentially stable groups, are passed through sons, usually the eldest, while daughters are given a substantial dowry. Kin Groups. Kinship among the Lao is reckoned bilaterally, and there is little genealogical consciousness beyond two generations except among the former aristocracy. Patrilineal clans and lineages can be found among the Hmong, Iu Mien, Khmu, and others; these clans are exogamous. Infant Care. Little research has been done on infant care among all groups in Laos. Among ethnic Lao, babies are constantly in the care of the mother and are fed on demand. With babies and children, separation is avoided and crying is actively discouraged. Usually the whole family sleeps together until the children reach puberty. Even in modern homes where children may have a separate room, they all sleep together. Older children are responsible for the care of younger children. Child Rearing and Education. Hierarchical inter-dependence is the central value instilled in children. Parents raise and support their children, and the children reciprocate as soon as they can. This creates strong family bonds. It is assumed that elders have the best interests of their children at heart; if they instruct a child to engage in a particular activity or marry, it is assumed that their motives are benign. A key rite of passage for Buddhist males is to enter the monastery, but no similar public event is available to women. Marriage and having children are their key rite of passage. In the past boys would receive their first education in the temples, but the temple has been eclipsed by government-run primary schools. Higher Education. Esoteric Buddhist knowledge is highly valued, but an awareness of the importance of higher education is increasing. Children from Sino-Lao or Vietnamese-Lao backgrounds are reputed to be the best scholars. They have special schools in the main cities. Similar attitudes can be found among Sinicized highlanders, such as the Hmong. Most higher education is pursued abroad. A national university was established in the early 1970s, but it was dismantled by the revolution. A Laotian dancer performs at Pha That Luang, the country's largest Buddhist Stupa, during the That Luang, or "Full Moon," Festival. Only in the mid-1990s was a national university reestablished. Restrictions on reading material and censorship by the government have discouraged the emergence of a culture of reading among adults. Among all groups, but particularly among the ethnic Lao, a high value is placed on the avoidance of conflict and actions likely to cause emotional discomfort. Careful attention to one's place in the social hierarchy is important, with inattention or deliberate flouting of the hierarchy being a major cause of conflict. The greeting of superiors by clasping one's hands in a prayerful motion combined with a slight bow was discouraged after the revolution, but has made a come-back in social interaction. Hierarchical interaction also involves polite forms of speech and body movements. Public body contact, especially between men and women, is avoided. Religious Beliefs. The ethnic Lao and some Tai groups are Theravada Buddhists. There are also beliefs usually labeled animistic and beliefs associated with shamanism that involve house spirits, village spirits, district spirits, city spirits, and spirits of the realm. At the higher levels these spirits overlap strongly with Buddhism and are embodied in stupas and temples. These beliefs in territorial spirits also are held by the non-Buddhist Tai. The majority of the population has various beliefs concerning sacred places and objects. Ancestor worship is strong among lineally organized groups. Christianity has made inroads among nonethnic Lao, with the Khmu, Hmong, Vietnamese, and Chinese most often being converts. Religious Practitioners. Monks are the main religious practitioners among Lao, and most young men are expected to become a monk for a short period to prepare them for marriage. This practice is also crucial for the transfer of merit from son to mother and is the source of a special bond between them. After 1975, entry into the temples was discouraged, but the practice is flourishing again. Most men enter the temple for not more than a month. Young men who stay longer are from poor families and are there to receive an education; some, however, stay for life. Older men sometimes retreat into the temple, as do a few older women. The monks not only are in charge of Buddhist religious ceremonies but function as dream interpreters, traditional medical practitioners, and counselors. Other religious practitioners include spirit mediums and shamans, most of whom are women. Shamans and mediums also are found among all the minorities. A ubiquitous ritual is the sou khouan or baci , which is a spirit-calling ceremony used at rites of passage and other threshold occasions. Among the Lao the officiant is usually an ex-monk who has attained considerable esoteric knowledge of the ritual language of the ceremony. Among non-Lao these ceremonies draw less on such Indic referents. Rituals and Holy Places. For ethnic Lao, the Buddhist lunar calendar marks the major annual rituals. At the full moon every month there is a festival ( boun ), the most important of which are the Buddha's enlightenment in the sixth month (May), the beginning and end of lent (July and October), and New Year (15 April). Sacred stupas and temples have special festivals. The most important is the festival held at the That Luang stupa in Vientiane in November. Syncretistic festivals that combine Buddhism and non-Buddhist beliefs are the Rocket Festival (a fertility festival) and boat races. The New Year is a key festival for most minorities, but is determined according to their own calendars. Death and the Afterlife. Among the Lao, cremation is practiced except for those who have anomalous deaths, such as women who die in childbirth. Although Buddhists desire the ending of the cycle of rebirths and the achievement of nirvana, the aim of most death rituals is to speed the soul of the deceased through the various hells and into rebirth through the transference of merit from the living to the dead. The remains normally are placed in a small stupa inside the temple fence. The remains are powerful magically, and offerings to them may channel that power into the fulfillment of one's wishes. This stops short of ancestor worship, which is found among the Chinese, Vietnamese, and non-Buddhist Tai. For them, burial rather than cremation is the norm and the ancestors are believed to be present and active in the affairs of their descendants; offerings are made to them on a regular basis. Modern health care remains rudimentary, but since the French colonial period, biomedical ideas about disease have spread and modern medicines are used even in the most remote villages. Depending on a person's level of education and exposure, biomedical ideas compete with or combine with folk ideas. Those ideas include spirit loss and the balance and imbalance of humors that can be remedied by diet and by herbal medicines. For spirit loss, a baci, or a shamanistic ceremony may be performed. The indigenous medical tradition that draws on Indian knowledge is paralleled by Sinitic folk medical traditions in the towns. Since 1975 the main secular celebrations have been associated with the party and state. The most important are National Day on 2 December, Freedom from the French Day on 12 October, Liberation Day on 23 August, Free Lao Day on 13 August, Children's Day on 1 June, Labor Day on 1 May, People's Party Day 22 March, Women's Day 8 March, Army Day on 20 January, and Pathet Lao Day on 6 January. The Lao New Year is a religious event, but is becoming secularized. Support for the Arts. Since the revolution, the arts have been under state patronage and direction. 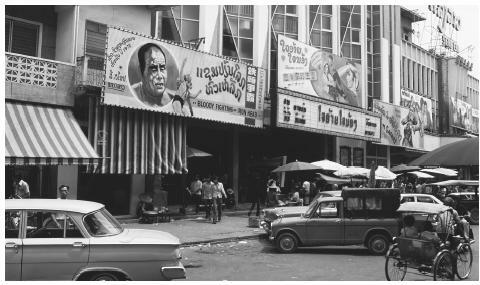 In the 1990s, some writers began to publish stories in Thailand for money, but publication inside Laos requires state approval. The reading audience is very small, and it is hard for artists to find an audience. Traditional performers can make a living independently from state patronage. Literature. Traditional literature draws on Indian epics such as the Ramayana but also includes indigenous forms such as Sinxay . There are no important modern novels, although a short story tradition developed under the RLG. Poetry has been a very important form. After 1975 the demand for socialist realist literature produced dreary propaganda, but in the 1990s less politically motivated literature and poems were published. Graphic Arts. Graphic arts are almost totally dependent on traditional Buddhist themes, which are expressed in an architectural form as murals or carvings on temple doors and window shutters. There is no developed practice of the fine arts, and cartooning disappeared after 1975. The other main form of visual art is silk and cotton woven cloth with elaborate and subtle patterns and colors. 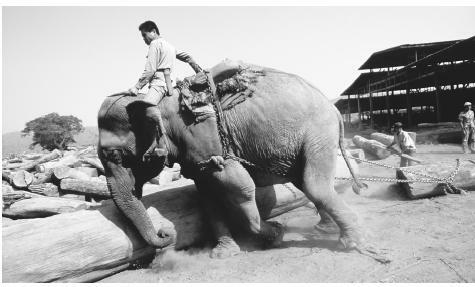 An elephant pulls teak and rosewood logs at the Pak Lay Sawmill. Logging is a major state-run industry. retraditionalize itself in the 1990s, it revived performances of the Ramayana. The actors and dancers are trained at the school for fine arts in Vientiane, and a similar school has been established in Luang Prabang. Puppetry and shadow plays have almost disappeared. Performances in which a male or female singer improvises or sings standard songs accompanied by an instrumental orchestra are still employed at important local celebrations. Popular songs leave politics aside and often deal with romantic love. A College of Pedagogy and a Royal Institute of Law and Administration were established in the 1950s, and the Royal College of Medicine was established in 1969. Those institutions were brought together as the foundation faculties of Sisavangvong University in 1972, but the university closed in 1976. Higher education was reoriented toward the socialist bloc, and students went to study in Vietnam, the Soviet Union, and other Eastern Bloc countries. In some cases, institutes were established within ministries and charged with doing research, but few people participated and in the physical sciences there was a lack of modern equipment. In the mid-1980s, there was an attempt to establish a Committee for Social Sciences along Vietnamese lines, but it was dissolved in 1993 and the different institutes were relocated. Some Lao began to study for higher degrees in Thailand, Australia, the United States, and France. A National University was established in 1996, but its facilities are poor and it is not research-oriented. Research in most fields is rudimentary, although significant joint research papers have been written on dengue fever and malaria by the Institute of Epidemiology in the Ministry of Health. In the social sciences nothing of significance has been produced since 1975. Archaimbault, Charles. Structures Religeuses Lao (Rites et Mythes) , 1973. Chazee, Laurent. Atlas des Ethnies et des Sous-Ethnies du Laos , 1995. De Berval, René. ed. Kingdom of Laos. The Land of the Million Elephants and of the White Parasol , 1959. Evans, Grant. The Politics of Ritual and Remembrance: Laos Since 1975 , 1998. ——, ed. Laos: Culture and Society , 1999. Ireson, Carol J. Field, Forest, and Family: Women's Work and Power in Rural Laos , 1996. Koret, Peter. "Contemporary Lao Literature," in Contemporary Southeast Asian Short Stories , 1997. Ovesen, Jan. A Minority Enters the Nation State: A Case Study of a Hmong Community in Vientiane Province, Laos , 1995. Proschan, Frank. "'We Are All Kmhmu, Just the Same': Ethnonyms, Ethnic Identities, and Ethnic Groups," American Ethnologist , 24, 1: 1997. Sahai, Sachchidanand. The Ramayana in Laos (A Study in the Gvay Dvorahbi) , 1976. Savada, Andreas Matles, Ed. 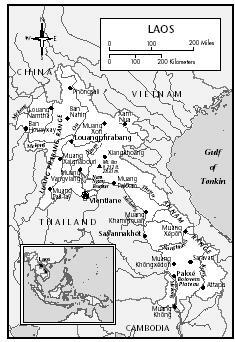 Laos: A Country Study , 1994. Stuart-Fox, Martin. Laos—Politics, Economics and Society , 1986. ——. A History of Laos. 1997. Walker, Andrew. The Legend of the Golden Boat , 1999. Zago, Marcel. Rites et Ceremonies en Milieu Bouddhiste Lao , 1972.
thankyou for this information it has really helped! needs more info about info bout what the food is used at for!!!!!!!!!! !THANK YOU! This article is very usefull for the researchers and students those who are interested in history. However, there is a very limitation for Lao or foreigners (especialy Lao) to be accessible to this information. I understand that copy right is very important but if this information can be freely dowmload, I think it would very useful for further develpoment in Laos. hey, do you a hve list of proposed oral and intangible heritage of humanity of laos? I really need it in my study. thanks. Thank you so much for this information! There isn't a lot on the social institutions and gender roles, I was completely struggling on a project until I found your page! Thanks again! i am doing a poject i my business class and this has helped me alot. Do you know what sports they have? thats the last thing i need to do. thx. this was a wonderul source. i have used some of the info in my cultural paper and i would like to cite it in APA format, but limited info is given. how would i cite this, so i can put it on my reference page? Please contact me ASAP Paper will be due in two days. i would like to know more about how the military infulenced the culture and the economy. Also i would like to know more of how the communistic country got started and how and why its stayed like it has so long. I would like to know more about the culture and traditions and to see if anything from other old communist counties like russia where im from played any part in it with it also with the communist countries like china and vietnam. i would really like to see this happen and would like some comment back on it please and thanks. Hi Im a middle school student doing a project on Laos and I would like to know what kind of clothes native people from Laos wear on a day-to-day basis. Thanks so much. This website was helpful. My best friend who turned boyfriend is Laotian, and I wanted to know more about traditions, and the role of women, and just more in general about Laos. I have a better idea now, thank you. This is great information. Just the stuff I was looking for. But at my school we are doing a project that is called Festival of Nations. I chose Laos as my country. But this is so frustrating and too much work for me. I am so tired to do homework and am glad that summer is almost here. To be honest, I am glad school is almost done, but I also love going to school most of the times. Well, I have to go now. But thank you for the information about Laos. It really helped. I would just like to say that this website has provided me with lots of information for a school assignment. But i was wondering if you know a bit about the employment in Laos? i need more info about lao traditional cloth..and also i need more about trip in laos.. Thanks for the info its great for my Heritage project in history. i wish i spoke this language but these days it so hard to even figure out how to you know with the economy being like this and all this culture just id so fun just to read about, i wonder what its like to live where they do. this website has really helped me with a research project for my foreign language class..thank you for all you help!! Can you tell me of the things Lao people give each other, like how the older relatives would give the grandchildren bracelets, white single threaded bracelets, and give them blessings, what are they really called? And how about the bracelets with several different colors? The bracelets called "faiy pouk khan" and for those have lots of color are the same thing as the white one. Nice work. It helped me with my studies. Thanks for producing such a great work. this is interesting!I want to visit Laos!this is epic and cool. Ihave to read this for along time! LOL! Wow. This has so much information that I would like to know since I am nyaw lao and born and raised in cali. Im always curious about lao people in laos. lovee this I have to do a project on lao and this gave me the perfect information. This country is so beautiful; everybody should go visit, to see for yourself. Hi, I am frome Vientiane, Laos and I am interested in buying one of the photo showing on this page. Its the one showing movie theaters on the street. Which I visited often as a kid. Please let me know where I can purchase the photo. Thanks.